The mission of the Brooklyn Museum is to act as a bridge between the rich artistic heritage of world cultures, as embodied in its collections, and the unique experience of each visitor. Dedicated to the primacy of the visitor experience, committed to excellence in every aspect of its collections and programs, and drawing on both new and traditional tools of communication, interpretation, and presentation, the Museum aims to serve its diverse public as a dynamic, innovative, and welcoming center for learning through the visual arts. 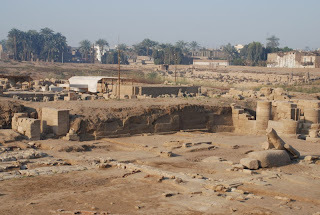 Since 1976, the Brooklyn Museum has been carrying out archaeological work at the Temple Precinct of the Goddess Mut at South Karnak, an important religious site for almost two thousand years. Dig Diary invites you to follow the recent work of the expedition in weekly photo journals covering every aspect of our team's activity. 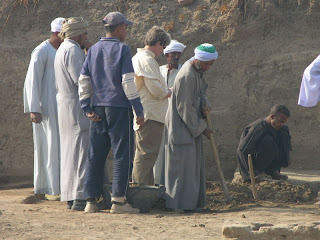 Dig Diary 2008 is just getting started. Follow 2008 at the Brooklyn Museum blog. On March 23, 2007 the Elizabeth A. Sackler Center for Feminist Art opens at the Brooklyn Museum. 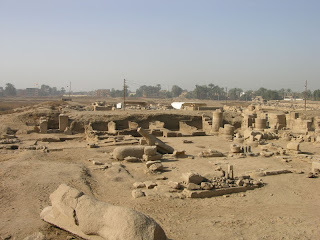 To celebrate the opening and the accompanying exhibition, "Pharaohs, Queens and Goddesses", we decided to devote the last posting of the 2007 season at the Mut Precinct to some of the female figures, mortal and divine, associated with the site. 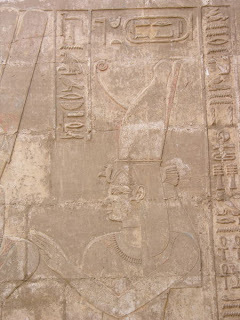 Hatshepsut being crowned by Amun-Re and granted life and dominion by the goddess "Great in Magic", from the reconstructed Red Chapel in the Karnak Open Air Museum. 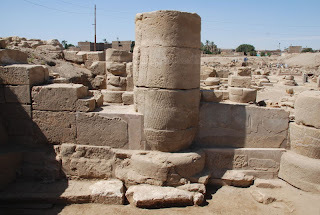 An early 18th Dynasty temple at Mut dates to the reign of this woman who ruled as king. 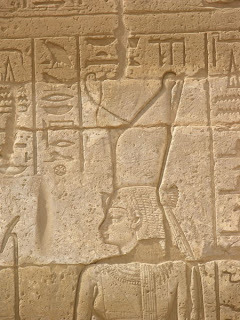 "God's Wife of Amun" was an important female priestly title in Thebes. In the 1st millennium BC it was usually held by a sister or daughter of the reigning king, each God's Wife adopting her successor. They became so powerful that they were able to have themselves represented in roles normally played by the king. In scenes of goddesses suckling humans, the human is normally the king, with the scene representing the transfer of life and power. 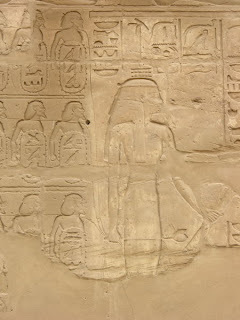 Yet in this scene in the Chapel of Osiris-Ruler-of-Eternity at Karnak, not only is the God's Wife of Amun, Shepenwepet I, being suckled, she is also wearing 2 Double Crowns, something shown nowhere else in any period. 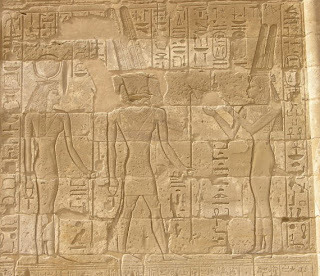 In her funerary chapel at the temple of Medinet Habu, Amunirdis makes offerings to Amun and Hathor. 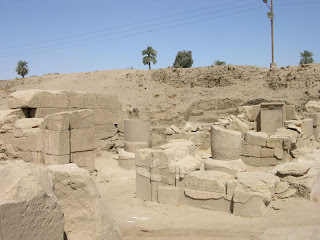 The presence of funerary chapels to mortals within the sacred grounds of a temple is rare until the Third Intermediate Period, a time when God's Wives of Amun flourished. Intangible concepts could also be represented as goddesses. 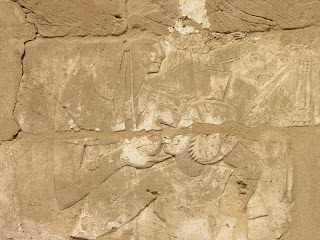 In a scene commemorating an important military campaign by Sheshonq I of Dynasty 22, the goddess "Victorious Thebes", carrying a mace, an axe and a bow, drags conquered cities (shown as bound prisoners with the city names enclosed in cartouches representing fortified walls) to be slaughtered. 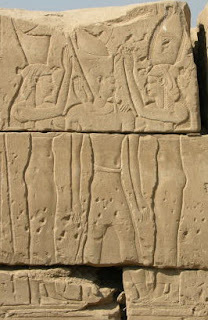 Upper and Lower Egypt were represented as the goddesses Nekhbet (right) and Wadjet. 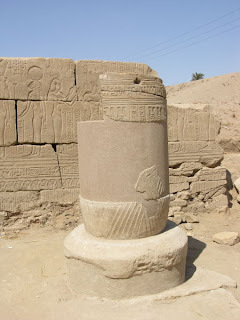 Scenes of the king flanked by these protective deities are common in all periods of Egyptian history. 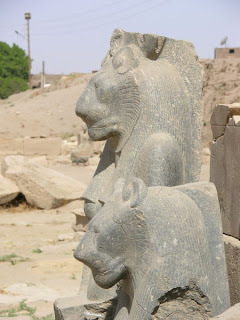 This one comes from the Mut Precinct's Ptolemaic Chapel D.
Keeping Mut and Sakhmet happy was a main function of the Mut priesthood. 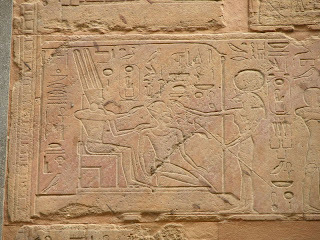 In this scene from the Mut Precinct's main entrance the king (holding Hathor-headed sistra) and two priestesses play music to Mut and Sakhmet to amuse them and keep them contented. 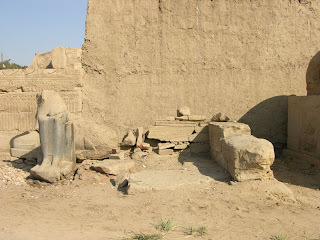 These 3 reliefs of Mut span a period of several hundred years. 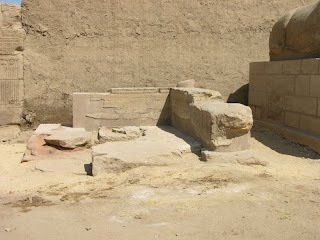 On the left is a relief from Amunirdis's funerary chapel at Medinet Habu; in the center a relief from the chapel of Osiris-Ruler-of-Eternity at Karnak; and on the right a relief in Chapel D at the Mut Precinct. In all three scenes Mut appears in her usual guise of a human wearing the Double Crown. 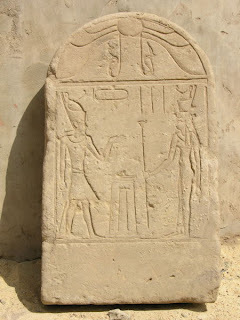 And finally, a stela of a king offering to Mut that we uncovered in 2006. While the stela is uninscribed, it is entirely possible that it dates to the reign of the Roman Emperor Tiberius, showing that Mut continued as an important goddess even after Egypt's conquest by Rome. It's hard to believe that the season is over already. We've put away the tools and said goodbye to the people we worked with. Now it's time for a summary of what we accomplished in 2007. 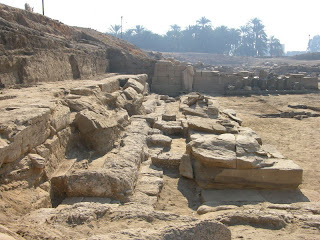 The east wing of the Mut Temple's 1st Pylon at the end of the 2006 season (top) and at the end of 2007, with much of the Roman Period construction removed. The bottom photo is Bill Peck's plan of the structures at the end of this season. 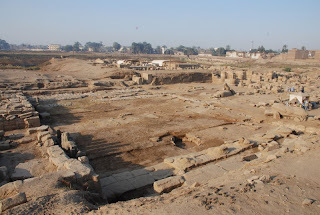 Next year we hope to complete excavation in this area, revealing the pylon as it was in the Ptolemaic Period when the temple was still functioning. The north side of Temple A's Forecourt at the beginning and end of the season. In addition to clearing the north wall and the enclosure wall behind it, we also cleared the Forecourt itself down to a more-or-less uniform level. 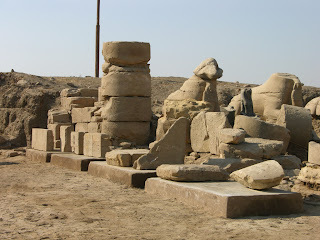 Looking east along the north side of the Forecourt to the temple's 2nd Pylon (top). 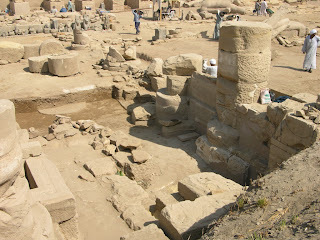 Between the mud brick enclosure wall (left) and the sandstone foundations of the colonnade (right) are the sandstone and limestone side walls of the Forecourt. 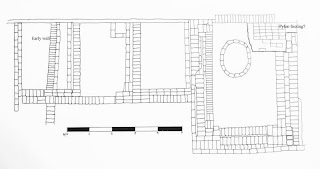 Bill Peck's plan of the area includes the small brick and stone building and round stone feature mentioned in an earlier posting. A similar view along the south side of the Forecourt at the end of 2006 (top) and 2007. The sequence of walls is much clearer. 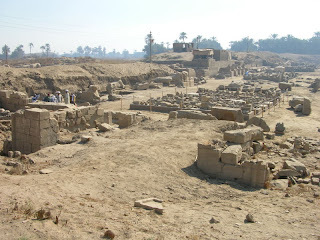 This photo was taken from the north enclosure wall and shows all of the Temple A Forecourt and area north of Mut's 1st Pylon at the end of the season. We finally moved the fallen column that lay across the middle of the East Porch (top). It was lying on a thin layer of broken paving beneath which we found the intriguing semi-circle visible in the lower picture. 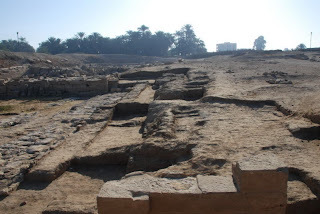 Is this the remains of an earlier, single-row colonnade? 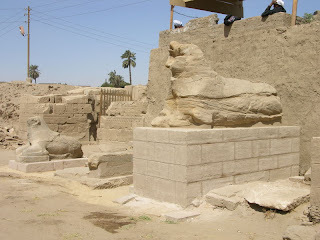 Looking west through the Taharqa Gate at the beginning and end of the season. 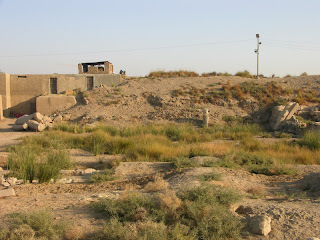 All we did here this year was to clear the area in preparation for excavation next season. 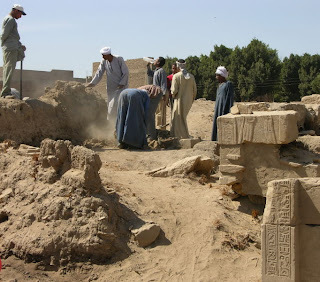 The SCA is closing all its on-site magazines at Karnak and transferring registered items to a new storage and study facility. 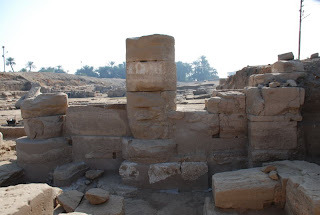 At their request, we re-organized our existing mastabas and built 11 new mastabas to accommodate the unregistered worked blocks and pieces of Sakhmet statues that were not transferred but needed safe housing within the precinct. 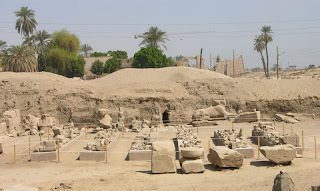 The pieces of Sakhmet statues now line the south side of our existing mastaba, east of the Precinct entrance. 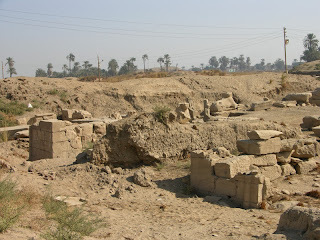 In the Mut Temple's West Porch 4 new mastabas hold the blocks from the small chapel built into the south end of the Porch. We hope to be able to reconstruct the chapel some day. 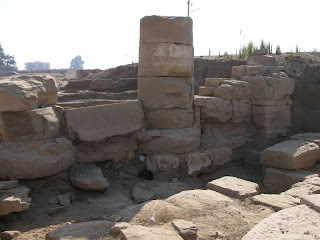 The 6 largest mastabas are in the area west of the Precinct entrance and they hold the bulk of the worked blocks. 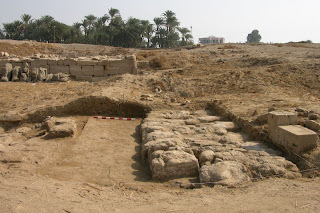 These blocks come primarily from Chapel D, the Mut Temple Porches and the Contra Temple. We said good-bye to Bill and Elsie Peck earlier this week. Elsie is our indefatigable recorder and artist. You see her here as she is usually found at the site, surrounded by workmen and taking careful notes of the work in progress. We could not function without her skills and, even more important, her patience, cheerfulness and determination to get things right. 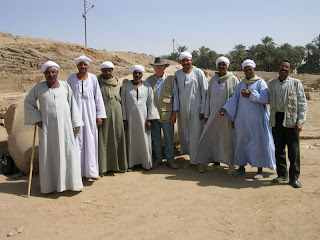 Here is Bill (our master draughtsman) with our Egyptian colleagues and friends on the last full day of work. Without them the expedition would not be possible: our foreman, Reis Farouk Sharid Mohammed (left); the expert Qufti who worked with us this year: Ayman, Salah, Mahmoud, Abdel Aziz, Mamdouh and Abdullah; and Abdin Ahmed Mahfouz (right) our inspector for the latter part of the season. We thank them all and look forward to seeing them again in 2008. 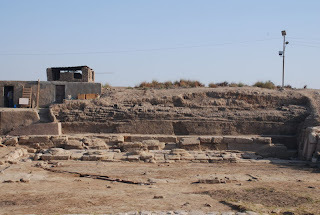 Restoration is a major part of our work at the Mut Precinct, as it is at any archaeological site. In 2007 we accomplished most of the goals we set ourselves at the beginning of the season. Here are the results. The east wall of the Mut Temple's East Porch was our first major project this year; you can see its condition at the start of the season. 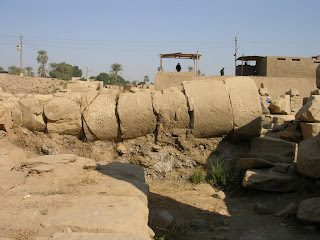 The foundations were in terrible shape and the single block of the intercolumnar wall had split vertically and slipped. You can see the split in the lower photo. The inner (top) and outer faces of the porch at the end of the season. The foundations are firm, voids where stone had rotted away have been filled, and the intercolumnar wall is once again a single block. Our second project was to repair the small chapel and the granite ram just inside the Precinct entrance. On the left is what they looked like in December; on the right, the chapel restored. Once the chapel was finished we could put the ram on its new base. It isn't very big, but granite is heavy and awkward to move, even with a siba. With the ram in place we could finally re-attach its left foreleg and Mohammed could begin to fill in the missing areas. The ram at the end of this week - a great improvement. 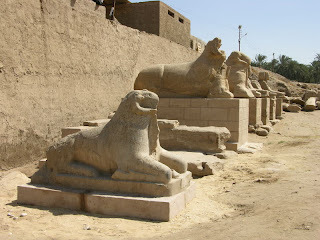 Looking east (left) and west yesterday along the row of rams, sphinxes and small chapels that line the enclosure wall east of the Precinct entrance. 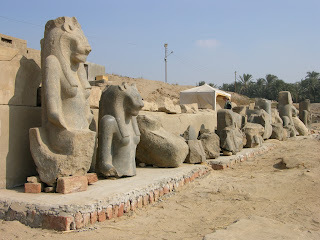 We don't know where the granite ram stood in antiquity but since it was found in this area, restoring it here made sense. It fits in well with its bigger cousins. In Chapel D this week we built the new section of column out to the proper circumference and applied the finishing coat. 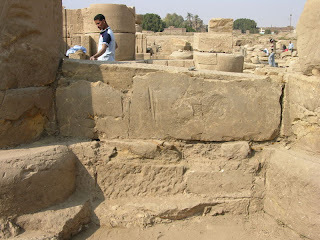 As well as reattaching the inscribed upper segments we were able to restore a portion of the lower decoration. The entrance and first room of Chapel D showing the results of our work in the 2006 and 2007 seasons. Chapel D will continue to be a focus of next season's conservation efforts. The walls of the inner rooms of the chapel are very badly decayed. 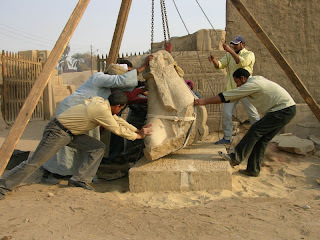 This year we were able to shore them up temporarily, but they have to be dismantled and rebuilt. 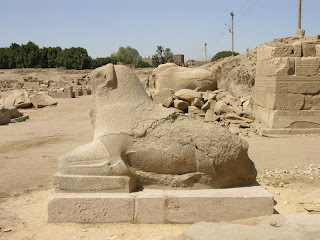 Our major project next year will be to excavate the Taharqa Gate and to restore it as much as possible. We got a start late this season with the removal of an old baulk (left), but as you can see in the lower photo we've got a lot of work ahead of us. 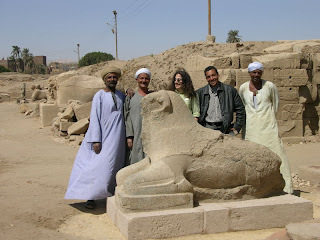 Lisa and her conservation team with the revived ram. Thursday was Lisa's last day at the site and we will miss her. 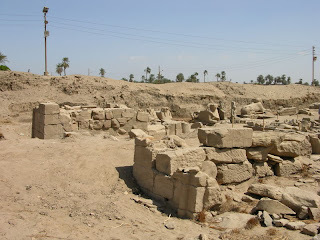 Despite sandstorms, occasional shortages of materials, and the challenges of on-site conservation she was able to maintain her sense of humor and her thorough professionalism. Thanks Lisa! As we are finishing up the last few conservation projects on the site, I have had the opportunity to try my hand at some new skills. As an object conservator at the Brooklyn Museum, I don't often (in fact, I've never) worked with lime mortar. Lime mortar is more in the realm of architectural conservators. Last year on the site, was the first time for me using mortar. Our masons Muhammad Gherib and Said Akmed Muhammad have used it a lot, especially when building walls from bricks or stones. 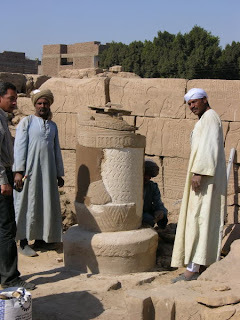 They also use it for making reversible fills in stone objects. 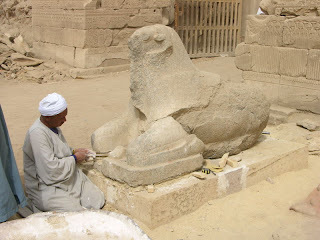 Here we are putting the finishing touches on the small granite ram. There is a large mortar fill at the ram's left shoulder. 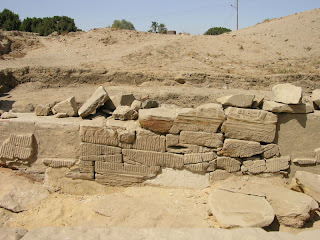 Basically, I watched Muhammad very carefully to see how he held the trowel, how much mortar he put on the trowel, and how he applied the mortar, and then tried it myself. Eventually, Muhammad was telling me, "Good. Good." With that, the season for me is over. I return to Brooklyn tomorrow, looking forward to coming back to Mut Temple next year, inshallah.